It’s been almost ninety years since Miss America (Norma Smallwood) was first photographed wearing a polka dot print swimsuit in 1926. Fast forward ninety something years and the print has transformed into a modern day, versatile wardrobe staple. 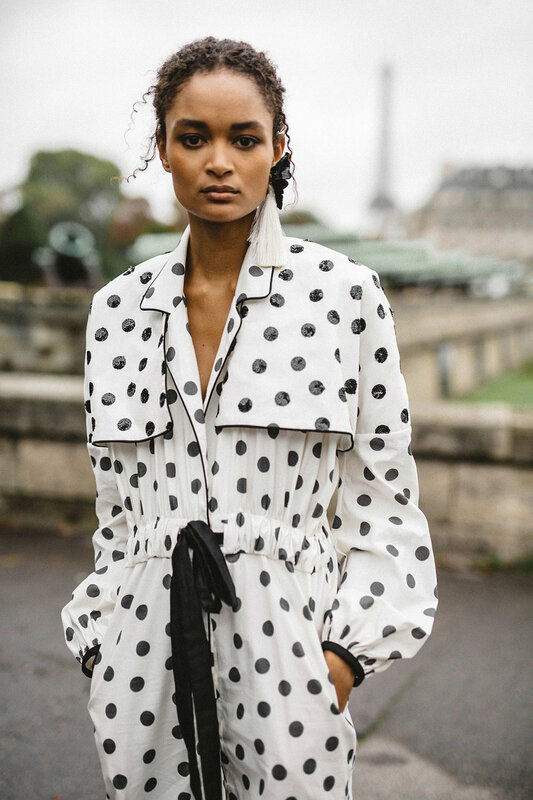 Withstanding the test of time, the polka dot has a quiet, unremitting air about it; routinely observed as the outfit choice to make a statement, the polka dot has a lengthy history, full of revival. With an inherently feminine and nostalgic feel, the polka dot is usually associated with the print of choice for children's party dresses. It would therefore be no surprise to learn that 'polka dot' in polish language is translated to 'little girl/women'. However, the polka dot has been depicted as a fashion staple as far back as 1867, namely in Frederic Bazille’s painting, 'family reunion' which portrays two women in high neck, polka dot dresses. Subsequently, iconic figures in history have adorned polka dots, providing an instant and lasting effect on fashions of the time. 1954 saw Dior release their 'new look' collection in what was reported as "Direct, unblushing plan to make women extravagantly, romantically, eyelash-battingly female" (Vogue, 1954). The polka dot dress was Diors bestselling piece of the collection, grabbing the attention of Hollywood icons of the 1950s; Elizabeth Taylor and Marylin Monroe. Both were key to the development of the pattern, assisting to cement itself as the timeless print that it is viewed as today. Of course, who can forget, fashion icon Princess Diana's unapologetic polka dot statement in 1986? Her power shoulder, peplum dress, with ruched waistband and matching hat made all of the headline at the time. The statement still feels as relevant now as it was back in the 80s and was not the only time Diana gave a masterclass in how to wear polka dots. Artist Yayoi Kusama's Sculptures, Paintings & Mirror Rooms exhibition in 2016 presented a direct link between polka dots and the art scene. The popular exhibition placed pumpkins shaped, sculptures with swathes of polka dots in 'infinity mirror rooms', aimed at giving a feel of everlasting eternity. The print, a favourite of the artist since childhood, certainly lives up to the ‘eternal’ link, with its continuous ability to endure the test of time. 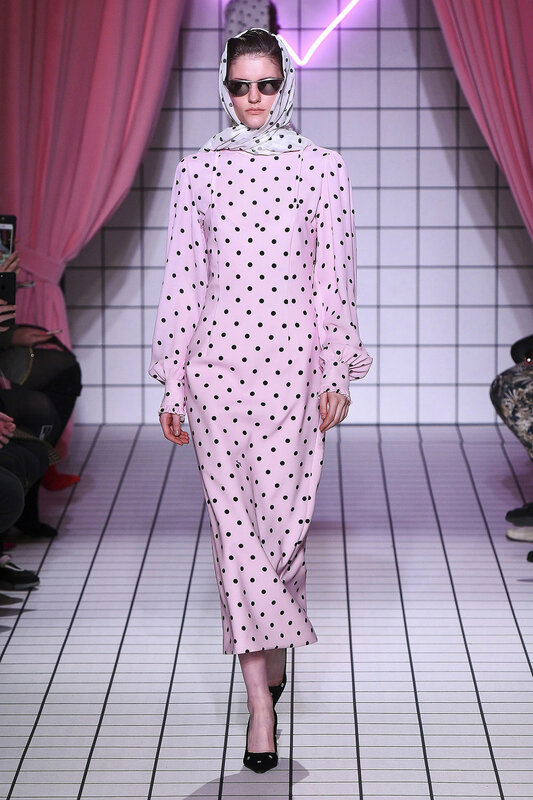 Coming with the same preconceptions as the peter pan collar, it is easy to associate the polka dot with a juvenile print, not exactly something you would adorn at say, an important meeting. 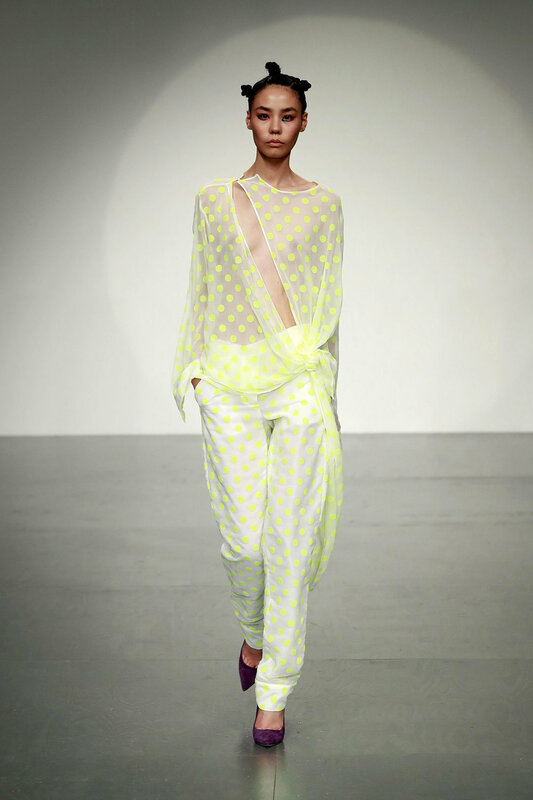 However, the polka dot is a versatile print that can be sophisticated when worn right. Today luxury brands and the high street are littered with refined fabric and modern silhouettes featuring the print. 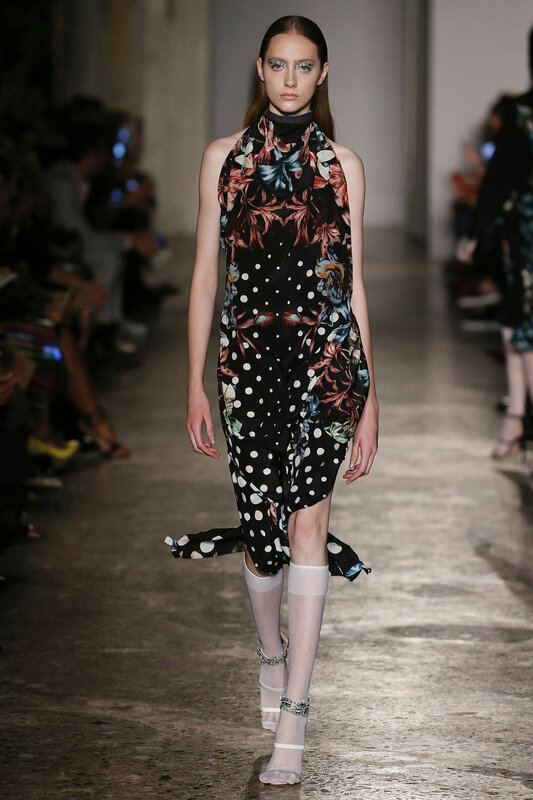 Speaking in terms of recent catwalk shows, SS18 saw designers such as Marta Jakubowski & Mary Katrantzou keep the polka pattern playful, with bright hues of neon colours and large sphere shapes; with the likes of Francesco Scognamiglio and Etro placing them more delicately throughout their creations. The trend is forecast to continue strong into the AW18 season, showing its ability to transition from season to season. Recent AW18 catwalks gave us polka dots from Antonio Marras and Vivetta amongst a long list; Erdem integrated the dots into divine gowns whilst Richard Quinn keep it completely outlandish. The Queen, making a special guest appearance was treated to Quinn's, loud use of colour, pattern clash, exaggerated volume and unusual shapes garments. So, for the wearer? Combine the print with this summer’s key skirt shape - the hanky skirt. Team with a fine knit roll neck or plain vest for maximum impact. Wear in the form of as sleek shirt, tucked into joggers for the off duty look; Or for the more adventurous, clash dots with stripes (see Miu Miu AW13). Beautiful designs available now from Johanna Ortiz tick all the right boxes, with Saint Laurent's offerings also proving wish list worthy. Worth the investment, these polka dot will be wardrobe classics you’ll rely on for seasons to come.